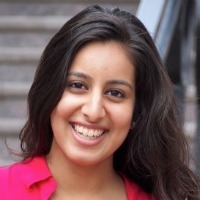 Komal Thakkar is a graduate student at The Fletcher School of Law and Diplomacy at Tufts University studying gender and development economics. She is passionate about a number of issue areas as they relate to women and girls including education, livelihood strategies and workforce development, and transitional justice. Prior to Fletcher, Komal worked in US based education nonprofits in New York City. She supported fundraising initiatives at an international education organization called Pencils of Promise, implemented programs at a mentoring and career development organization for first generation college students called America Needs You, and worked in program evaluation at a school leadership development organization called New Leaders. After Fletcher, Komal would like to pursue a career advancing the rights of women in an international development organization. Komal completed her bachelor's degree at the George Washington University and is a New Jersey native. In her free time, she enjoys dance and yoga.